Crime-prevention foundation Shout South Africa will feature on the next instalment of Brand South Africa’s Play Your Part TV series, to air on Sunday 17 August on SABC2 at 9pm. On the evening of 18 October 2007 legendary South African reggae musician Lucky Dube was dropping his son and daughter – two of his seven children – off at their uncle’s house in Rosettenville, Johannesburg, when hijackers pumped two bullets into him at close range. He tried to drive off, crashed into a tree, and died on the scene. But almost every article reporting his death also raised South Africa’s high rate of violent crime. “South Africa is considered the murder capital of the world, with 20 000 murders each year,” the Guardian wrote, while the BBC described the country as “one of the most dangerous societies in the world”. The murder came three years after respected Mozambican bass guitarist Gito Baloi was gunned down, also in Johannesburg, in 2004. Dube’s death impelled two South African musicians, kwaito artist Kableo Mabalane and pop star Danny K, to do something about violent crime in South Africa. They decided to release a single recorded by as many local musicians as they could gather – in the style of the international 1980s “We Are the World” project – and use the proceeds to fund crime-fighting and victim support initiatives. In 2010 Mabalane and Danny K, with contributions from 37 other South African musicians, released their cover of “Shout”. The song also became the name of their new crime-prevention foundation – Shout South Africa. 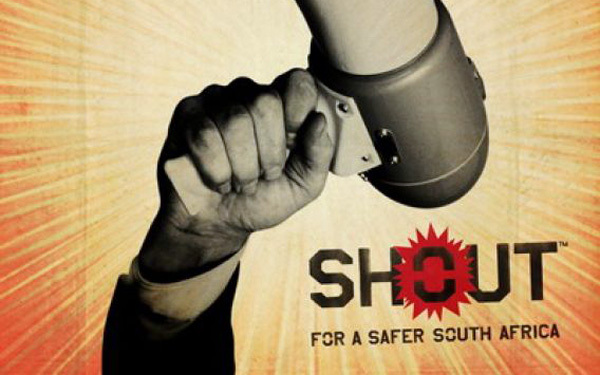 Shout raises funds through merchandising and music downloads. Its beneficiaries include specialised units in the South African Police Service, as well as NGOs such as the National Institute for Crime Prevention and the Reintegration of Offenders, People Opposing Women Abuse, Childline, and Alcoholics Anonymous. Shout released a second single, a South African adaptation of John Farnham’s 1986 hit “You’re the Voice”, in 2012. The list of 34 artists contributing to the song reads like a who’s who of the South African music scene, including Hugh Masekela, Freshlyground, Mafikizolo, PJ Powers, Arno Carstens, Loyiso, Kurt Darren, Louise Carver and the Drakensberg Boys’ Choir. and the Shout South Africa foundation was born.